We design and build high-resolution scanning laser ophthalmoscopes (SLO) with and without adaptive optics (AO) for advanced retinal imaging and stimulation. Other system developments include software tools to improve AOSLO usability in the clincial setting, and for eye tracking-based realtime correction of chromatic offsets for microstimulation with foveal cone precision. 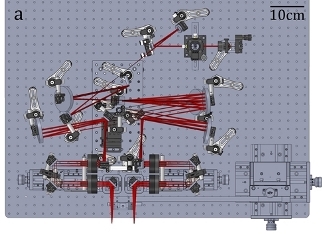 Lennart Domdei is currently designing and building a binocular scanning laser ophthalmoscope that will feature full control of relative eye position, binocular vergence angle, and a Badal type defocus correction unit. 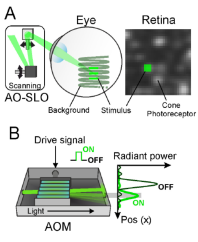 A second visible wavelength will be utilized for retinally tracked visual micro-stimulation. The general system design (Field-split by knife edge in conjugate retinal plane) is based on an earlier prototype by Scott Stevenson, Austin Roorda and Christy Sheehy (DOI:10.1016/j.visres.2015.01.019). Optics not in yet. Photograph taken during build phase, 18. April 2019. Top view of complete Solidworks model. Contact wolf.harmening@ukbonn.de for more details. 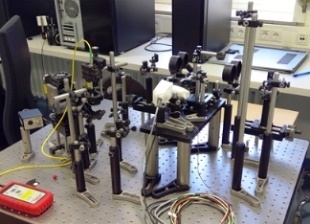 One of the interesting technical issues in multi-wavelength AOSLO-based microstimulation is that chromatic dispersion properties of the eye will cause light of different wavelength to focus at different axial and lateral locations, phenomena termed longitudinal and transverse chromatic aberration (LCA and TCA, resp.). These effects are small, but large enough to throw off cell-targeted microstimulation. In the lab of Austin Roorda at University of California, Berkeley, Lawrence Sincich and Wolf Harmening have devised a method to measure transverse chromatic offsets with arcsecond precision, based on the retinal images created in the AOSLO with the wavelengths used. In response to this publication, renowned optics expert Pablo Artal pointed out that our method may be a useful tool to measure TCA objectively in a number of applications. This has triggered a few key publications, including those by Simon Winter and colleagues. Artal (2012) Comment on "Measurement and correction of transverse chromatic offsets for multi-wavelength retinal microscopy". The transverse chromatic offsets (TCO) present in our AOSLO setup are directly proportional to eye position in front of the imaging beams. Thus, to relief the need for ultra-stable head positioning and the need for re-measuing after head (and eye) movements, Niklas Domdei implemented an eye-tracking based calibration routine to accurately map TCO to the image space of a pupil camera. No re-measuring required, and we also found that angle Kappa of the eye serves as a good proxy of foveal TCA. Domdei N, Linden M, Reiniger JL, Holz FG, Harmening WM (2019) Eye tracking-based estimation and compensation of chromatic offsets for multi-wavelength retinal microstimulation with foveal cone precision. We use acousto-optic modulators (AOMs) to control intensity of the raster beam of the AOSLO to produce visual stimuli on the retina of an observer. AOM light switching is fast but comes at the cost of incomplete extinction of light during the OFF state of the switch. As a consequence, background light will be visible, even if the stimulus is turned off altogether. To remove that background light leak, and to improve visual contrast for visual stimulation, Lennart and Niklas Domdei came up with a rather simple solution: by cascading two AOMs, serially feeding the output of one AOM into the input of a second AOM, extinction ratios will be multiplied, finally creating paramount visual contrast.